Majesty Yachts, the flagship brand belonging to Gulf Craft, announced its presence at the upcoming editions of the Cannes Yachting Festival (September 11th to 16th) and the Monaco Yacht Show (September 26th to 29th). Along with its exclusive dealer for France and Monaco, Aurora Yachts, the brand will showcase the rising stars of their superyacht line-up at the two prestigious yachting events in Côte d’Azur. 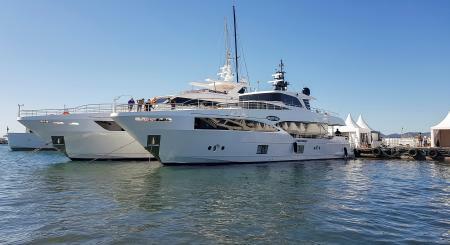 The successful Majesty 125 and Majesty 100 will be on display at the Cannes Yachting Festival. A true testament to the global confidence in the Emirati shipyard’s pioneering vision, innovative design and advanced technology, the two superyachts are having an impressive growing presence in the Middle East, Asia and more recently Australia and Europe. The Majesty 100 is the first in the brand’s collection to have a sky-lounge, which allows the guests sitting within its spacious lounge area to enjoy a breath-taking view of the vast seascape, with the added luxury and comfort offered by indoor living. The 125, the smallest yacht, is a significant addition to the line-up, an engineering marvel to feature 3 full decks, and a flybridge sun-deck that makes it extremely popular with its owners. Moreover, during the course of the Cannes Yachting Festival, three of the brand’s superyachts – Majesty 125, Majesty 100 and Majesty 140- will take part in the coveted World Yacht Trophies. While the Majesty 100 and Majesty 125 yachts will be displayed at the Superyacht Extension in Cannes, in Monaco they will be displayed at berth nos. F20 – F21 at the Quai des Etats-Unis.